ArtBuilt provides affordable space opportunities, public arts programming and asset-building resources for artists, artisans and neighbourhoods in NYC and beyond. 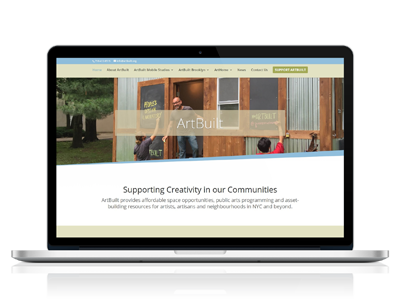 Esther & Guy needed a website created for their non-profit ArtBuilt and needed to convert their existing ArtHome.org website from Drupal 7 to WordPress. The new website I created incorporated both ArtBuilt and ArtHome in one to make it easier for artists to find the information they are looking for. Cat was an absolute pleasure to work with – knowledgeable, skilled, generous and focused, with a really great personal manner & excellent communications. She handled indecision & schedule-slippage on our side with good-natured professionalism, and delivered exactly what we were looking for, promptly and with excellent documentation. We’d hire her again in a heartbeat, and fully intend to reach out to her next time we have a job that fits her awesome skill-set! Installed WordPress on the server and setup a MySQL database.